Paton Industries offer all purpose hay cradle to feed sheep, calves and cattle. The SHC 14 Hay Cradle has the capacity to hold one round bale of hay, straw or silage. The SHC 25 Hay Cradle has the capacity to hold two round or 1 square bale of hay, straw or silage. 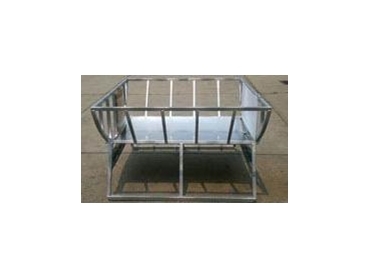 These feeders are suitable for sheep and calves (however they are also used for cattle and horses). They come complete with a metal base, which eliminates waste. They are easy to relocate even when full (With forks or similar). The CHC 14 or 25 Hay Cradles are almost identified to the SHC hay cradle models, except they are designed for larger adult cattle only. They are made from heavier RHS and have a full metal base which encloses the supporting frame completely. Young animals have no ability to eat from below.